Lost your owner's manual? press here to download a text copy or here to download an html copy. NEW! Dave has made a series of five videos on using LeakSeeker 82B HD! The videos show Dave demonstrating how to use the normal 2-wire method, the 3-wire method, the hot air method, and the High Defination method to locate shorted components on both a standard pc board as well as a multi-layer computer motherboard. Go to the LeakSeeker page and enjoy! The LeakSeeker was updated 8/01 so that it can now trace down shorts on a multilayer or motherboard with no power traces, where power is supplied by one huge metal plane on the top or in the middle of the pc board. Impossible, you say? After all, there are no traces! Actually, with cooperation with the Toro group, we have experimented and found that the old LeakSeeker (82B version with the 10/98 pc board) can easily be modified for 100 times the sensitivity it normally has when the "window" is locked in the high-resolution mode. Where a normal LeakSeeker beeps at the same pitch on every pad connected to the power plane (as you probably would expect), the upgrade increases the resolution so that you will hear a noticable difference in pitch in every pad. After you do the modification (described below), the easiest way to find the shorted component is to first allow Leakseeker to auto-calibrate as usual on any pad connected to the supply showing the short, then pull out the knob to the high-rez mode and adjust the OFFSET while touching the pad, for a reading in the middle of the yellow LED group. Then simply touch each power pad of every component on the power bus and replace the one pad with the highest pitch. No probing along the power supply trace is required, since there isn't one anyway. Obviously some knowledge of which components (and which pins of those components go to the power source) will be needed, so hopefully you will have either a schematic or a pcb layout diagram that shows the power supply plane. Of course, you can also do the chill method, where you solder the test cable to the shorted circuit and simply spray freeze spray over every component until you hear the pitch change. This method is well documented in the owners manual. To do the modification, replace R16 (681K 1%) with a 15K 1% metal film resistor, and R17 (47.5 ohm 1%) with a one ohm 1% metal film. Because the numbers are under the resistors, I'll describe where they are: Locate IC8, and you will see three blue metal film resistors to the right and below IC8. The one by itself is R17, and of the two resistors below, the one on the left is R16. Note that there is an identical 681K 1% resistor to the right of R16; leave that one alone. The "world" version of the LeakSeeker is normally set at the factory for 100-120VAC. On these units only, to set the unit for 220-240VAC, remove two screws on the bottom and remove top cover. Remove the four screws holding the pc board assembly and remove bottom cover. Be sure your unit is the international version by verifying that the transformer has eight pins, not six. On the bottom of the pc board, cut the two traces at the pinched areas shown with arrows. Solder a wire across the two pads shown with a dotted line and arrows. Use a plug adapter to change the power plug to the one used in your country. 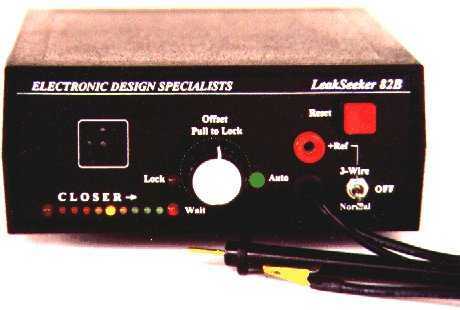 As you know, the LeakSeeker is designed to provide its own precise voltage and current from the test leads, and the unit under test must be powered down. Some users have been somewhat careless (I know, a customer interrupted your train of thought!) and after probing a powered pcb foil, your unit now beeps in agony all the time and won't reset. Or smoke pours from every hole. Or is DOA. What happens is that the power from the unit under test feeds back into the unit's 8VDC supply and fries all nine chips. Not good. To eliminate this problem, all 82A units shipped after January, 1998, and all 82B units have a 9 volt zener diode (1N4739A) added to the pcb across the test probe to ground, to short any voltage higher than 8 volts forced into the test probe. Also, a 0.33 ohm 1/4 watt fireproof (metal oxide) resistor is installed in series with the test probe cable, to act as a fuse. If you purchased your 82A before this date, you should do this modification. Unless of course you are perfect and never make mistakes. Replacing nine chips on a double-sided pcb is time-consuming and costly, and is not a valid warranty claim. If you prefer, you may send your 82A back and we will do the modification for you. Remember that if you think your 82A isn't working correctly, be sure that the OFFSET knob is pushed in for AUTO, and push the RESET button, then try again. The updated 82B has indicator leds for AUTO calibration, and window LOCK to eliminate this error. This instrument is unique and more time is required for most techs to master it. If your unit was purchased before May, 1997, you have an older design which was harder to use, because it instantly recalibrated to the wrong resistance if you acidentally touched the wrong pad, and the CALIBRATING led flashed so fast that it was easy to miss. The newer units are designed to turn on the led for a full second before recalibrating, giving you the chance to pull your probe off of the incorrect pad before the 82A recalibrates. These older units also do not have the zener protector circuit. If you have this version and want it modified, you may send your unit in to bring any older version to current specs. This modification is to difficult to do in the field and must be done by EDS.